"Light" is not solely synonymous with "illumination". In fact, light, in addition to illuminating spaces, has the power to delineate the mood in every room uniquely. It is everyone’s wish to come across pleasant and special visual and sensory experiences in every room. If you are designing the lighting system for a private home, make sure that even the youngest can enjoy a welcoming and private atmosphere. Children and teenagers spend many hours of the day in their room. We’re talking about a private and often jealously guarded room since children considered it a small world apart to rest, read, play and study. 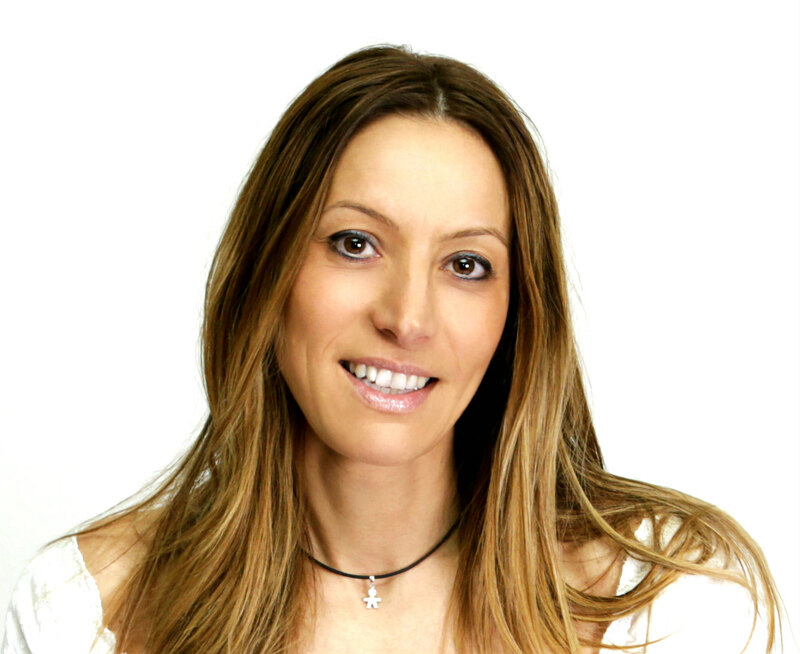 For this reason, it is essential to set up a welcoming atmosphere conducive to the fulfilment of daily activities. The aim is to select lamps for children's bedrooms that can provide functional lighting levels and characterise spaces with originality. Before identifying the type and model of lamp that you are going to place in the room, you should take advantage of 5 key suggestions that, if put into practice correctly, will positively influence the bedroom’s lighting design. If the room is not particularly spacious, you may want to set up smaller floor or table lamps, for example. In addition to providing light, these solutions furnish a room without weighing down even the smallest spaces, making the bedroom feel less empty. For a large bedroom, perhaps you could opt for a suspension lamp to provide total illumination to the room. As for every area of the house, functional lighting solutions are also needed in the bedroom. Thinking of the daylight hours, we immediately think of activities such as playing, reading, studying, writing, drawing, etc. To illuminate activities, you could set up a table lamp, for example. Practicality and comfort are essential prerogatives for a bedroom. So make sure that a nightlight is included in the lighting project designed for children's or teen's bedrooms. You could install a nightlight near the bed, easy to reach. Big kids and small kids must be able to move around comfortably even at night. Play with light and do not be afraid to be daring. Combining the use of multiple solutions is by no means a risky move. On the contrary, you will notice that the room will take on a new appearance. It will shine with personality thanks to the different design features of each lamp and will enjoy higher lighting levels. In addition to table or floor lamps, ideal for workstations, you could use suspension lamps or ceiling lights as primary light sources for the whole room. Do not forget about ambient lighting, whose light sources must always guarantee freedom of movement, excellent visibility and a welcoming atmosphere. A dimmer would also be ideal to calibrate the degrees of brightness based on the daily activities performed in the room. Yes, even coloured lights. They entertain the eye of the little ones and even delight the older kids. But be careful not to overdo it, in the long run, they could be too much. 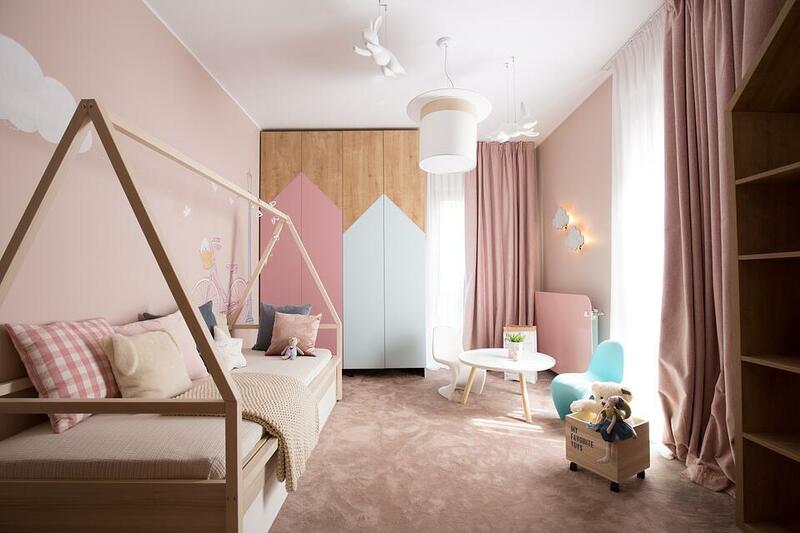 Now that you know these 5 simple tricks you will be able to make more targeted stylistic choices regarding the lamps for children's bedrooms. Consumers of different ages are attracted to different shapes and shades of light. Without a doubt, we can say that the details and style of a lamp capable of captivating a child will never be able to capture the attention of an adult. In addition, psychological aspects and safety criteria should decisively influence the choice of the most suitable lamp for illuminating the bedroom. Psychological aspects mean the perception of a certain atmosphere based on the light and style of the lamp. In this regard, we will now delve into these concepts, analysing lamp models designed for children and young people of all ages. Although still very small, from the first few months, children begin looking for sensory stimuli on a visual level. By applying one or more suspension lamps above the cradle, for example, you will create a synergy of light that will capture the baby's gaze and have a calming effect. In this case, Wow! might interest you. Wow! is the amazement felt in front of a magician who pulls out soft white rabbits from his hat. Karman gives you the possibility to reproduce this magic by adding white matte ceramic bunnies to the sides of the white linen cylinder-shaped shade. It is an unexpected surprise that gives the name to a unique suspension lamp, designed by Matteo Ugolini, capable of acting both as a furnishing item and a lamp for children's bedrooms. In this age group, children show an uncontrollable desire to move, play and explore, looking about here and there. To prevent them from coming into contact with cables and electrical outlets, choose suspension lamps or appliqués. 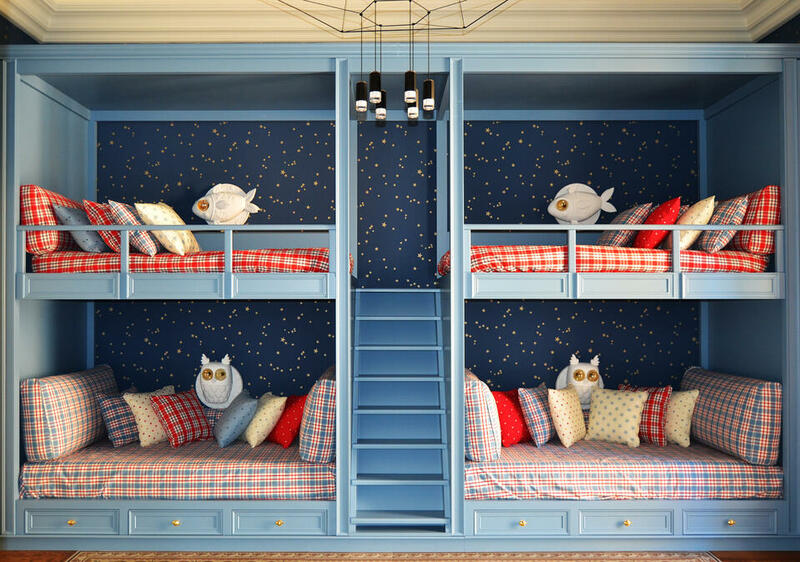 Choose lamps with a creative design for children's bedrooms. 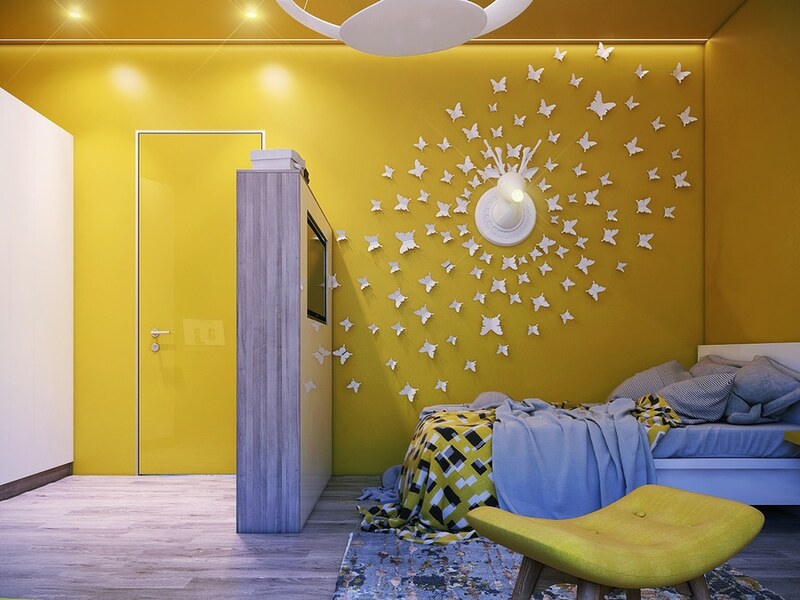 In addition to decorating the room, the lamp’s bright colours and eccentric shapes will stimulate the child's sight. It is during this period that the youngest begin to develop a fear of the dark so it would be better to choose sources of intense light, bright enough to accompany them throughout the day and at night, above all. When it comes to "combining business with pleasure" check out Marnin: the solution designed by Matteo Ugolini that combines optimal lighting and original decoration. It is an appliqué lamp in opaque white ceramic that emulates the appearance of a curious reindeer that peeks out from behind the bedroom wall and illuminates the room with direct and intense light. A playful and fun source of lighting, no doubtsuitable as a lamp for children's bedrooms in this age group. Another unique appliqué is Ti vedo, another designer lamp designed by Matteo Ugolini. It is not a threatening phrase, but a peaceful warning: a cute little owl looks on from the wall and illuminates the children's bedroom. You could apply Ti vedo over or on the sides of the bed. When turned on, this lamp gives functional light levels to the spaces, especially in the dark, while on the other hand it functions as a nice decorative element. After “Ti vedo" Matteo Ugolini created April: a white ceramic appliqué that plays the role of a fish with floral motifs instead of fins and scales. A fun lighting solution suitable for the little ones’ bedroom. Leaves that seem to be lifted by the wind appear to float in a motionless dance along the walls, illuminating the bedroom. We are talking about Eden, an appliqué available in three dimensions, designed by designer Matteo Ugolini. The lamp is characterised by an iron structure with sinuous lines reminiscent of the veins of a real leaf and a white lycra diffuser that filters the light softly. Once the adolescent period has been reached, the user's tastes will change sharply, and consequently, the desired appearance of the bedroom will change. 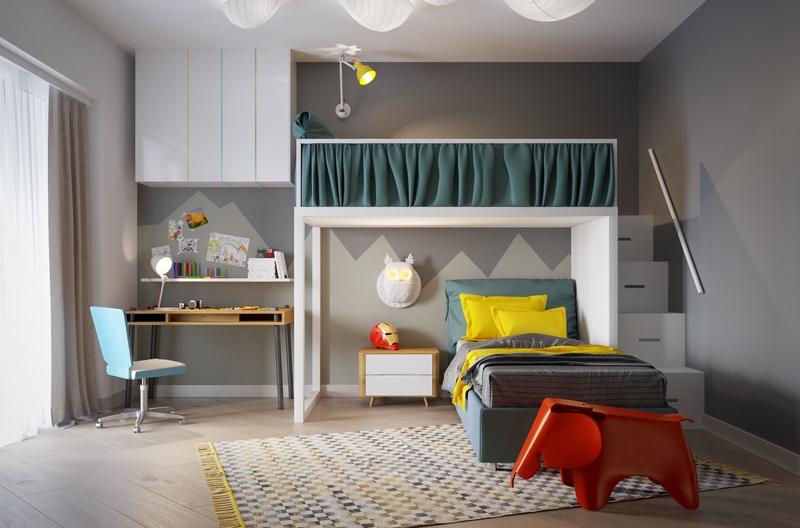 Now the bedroom lamps play an even more central role since they serve to illuminate the room overall and with particular attention to the desk, bookcase and bedside table, areas often used by young people in this age group. Suspension lamps, table lamps and appliqués are the best solutions in this specific case. With Notredame, by Luca De Bona and Dario De Meo, the light radiates through the particular geometries of a rosette made of marble dust. This lamp, used as an appliqué, suspension or ceiling lamp, is a mature search for style and originality. It is a lighting element with an intricate design that is suitable for young people. Combine more lighting solutions for the bedrooms of young adults. In this case, you could even take a chance with the style and design characteristics of the lamp, moving away from a lighting design concept focused on playful shapes and bright colours to achieve impact silhouettes and more intense shades. Sharp lines articulated in a ribbed metal rod structure in its natural colour or white: this is how Sisma presents itself, a lamp with an essential, elegant style and an amazing decorative ability created by Matteo Ugolini. As a suspension lamp, it could provide excellent lighting for activities done on a desk or work tables. While as a floor lamp, it could be placed in the corners of the room and provide accent lighting. However, in both versions, Sisma is suitable for the bedroom of young adults and teenagers. 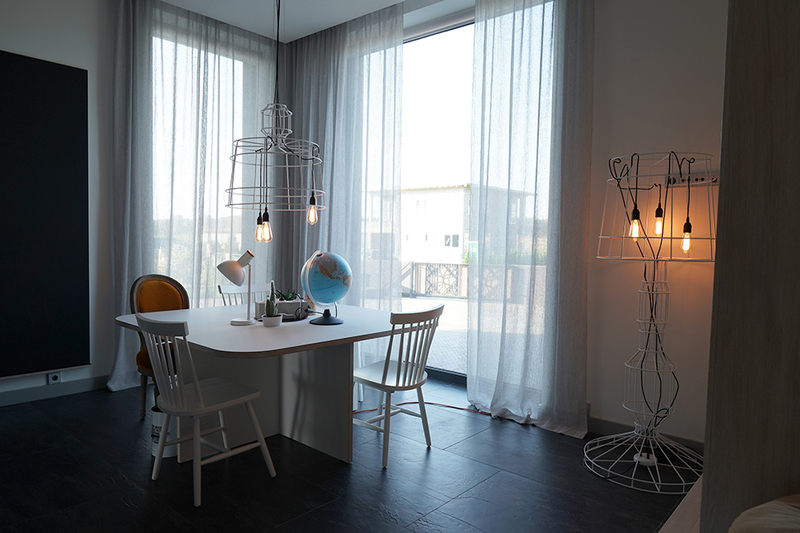 We suggest creating new and dynamic lighting designs by knotting and hanging the light bulb cables to the lamp's frame in the varying positions. The bedroom is much more than a simple bed for sleeping. Depending on the age of those who make use of this room, it will be used for different purposes. Over time, a recreational and playful corner will turn into a playroom frequented by guests, and later a space dedicated to studying and relaxation. This continuous change implies difficulties in choosing the ideal lighting solution for this area of the home. But do not worry, there are lamps for children's bedrooms that can satisfy the taste of adults and children. Appeal to creativity and imagination to illuminate this room, without neglecting safety and functionality, fundamental aspects that ensure maximum comfort. For more information, support and assistance in correctly choosing the right impact of the lamp models for the bedroom, do not hesitate to contact us at this link. We are at your complete disposal.